rossparkzoo.com Binghamton Zoo at Ross Park is hosting its 27th annual Halloween event, Boo at the Zoo, this weekend. This weekend saw the beginning of the 27th annual “Boo at the Zoo” festival at the Binghamton Zoo at Ross Park. This haunted Halloween adventure begins as guests are greeted by a sign of bloody handprints and a menacing clown to welcome those who dare to enter, many being previous attendees. This event is a one-mile loop around the zoo, where guests are met by many horrors along the way. This includes scenes such as the “Zombie Hoard,” “Freak Show,” “Scarecrow Scene” and the newest addition, “Creepy Christmas,” along with clowns, zombies and other creatures haunting the path. The new scene, “Creepy Christmas,” was inspired by a previous zoo event around the holiday season. “A couple of years ago, we did a whole Christmas holiday event here at the zoo and we haven’t done it for a couple years, so we went through all the props we have and thought this would be a perfect new and unique scene for us to do,” Davenport said. Another new aspect of this year’s event is the increased influx of volunteers who make this event possible. The event’s volunteer coordinator, Catherine Dietz, said she was impressed with the number of volunteers who are participating in comparison to previous years. Many of these volunteers come from student organizations at Binghamton University, and Dietz frequently reaches out to different organizations such as Greek life and Student Association-chartered clubs about the different volunteer opportunities. Natalie Laino, a member of the student volunteer organization Circle K and a sophomore majoring in mathematics, volunteered for this event because it reminded her of her childhood. “When I was younger, there was a spooky walk near my house and I always loved to do it, and then I got the opportunity to scare people and be on the other side of it, so I knew I had to do this,” Laino said. Others, such as Pragna Krishnamurthy, a fellow member of Circle K and a freshman majoring in integrative neuroscience, chose to volunteer for this event for the thrills. “This is one of the events that sounded really cool and interactive compared to other events,” Krishnamurthy said. The volunteers in their costumes and makeup certainly contributed to the scary atmosphere experienced by guests, one being local 9-year-old Ava Mathews from Maine-Endwell, accompanied by family, who wanted to go through the event again upon completion. “It was scary and I really liked the clowns chasing me,” Mathews said. The spooky success of this event depends on its enthused volunteers, and Davenport encourages more students to get involved. “Year after year, we look for people who love Halloween, because they’re the people who go above and beyond for this volunteering opportunity,” Davenport said. 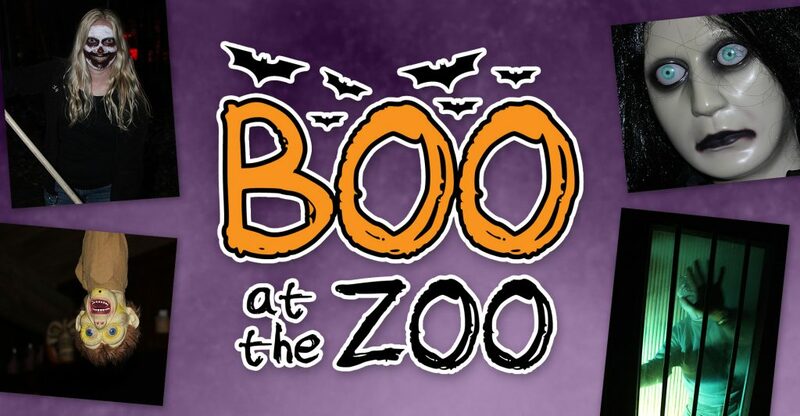 There’s still time to get in the spirit for more Halloween horrors, and the opportunity to attend or volunteer at “Boo at the Zoo,” which will continue this weekend, Oct. 26 and 27, with doors open from 6:30 p.m. to 9:30 p.m.